A global pharmaceutical company was promoting a program to educate nationwide pediatric healthcare professionals about a specific medical risk in children. The company sought more program signups and improved program awareness as soon as possible. RNsights proposed a 3 month campaign to reach the highly targeted audience of healthcare professionals in multiple ways. To broadcast the messaging, RNsights used a variety of tools including a web resource center, banner ads, email campaigns and newsletter insertions. 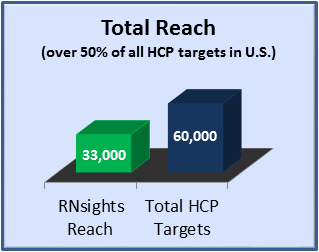 The pharmaceutical company has now returned to RNsights for multiple successful campaigns and projects reaching different HCP targets.